Marc Lievremont insists that there is no divide in the French camp - despite revealing that his players snubbed his offer of a team-bonding session over a few drinks after Saturday's shock defeat by Tonga. Les Bleus were on the receiving end of one of the biggest shocks in Rugby World Cup history when they slumped to a 19-14 loss to the Tongans in Wellington. The horribly disjointed nature of the display only seemed to add creedence to the claims within the French media that Lievremont has lost the dressing room. And while Lievremeont claimed on Sunday that the players remain united, he admitted that there was no sense of togetherness in evidence after the game at the Westpac Stadium. "I would have liked for us to gather around a few drinks yesterday, to talk, to share thoughts, to tell each other that it's a beautiful adventure, all things considered. And I was disappointed," he said. "At the end of the press conference, I got us some beers to release the pressure - and we all split in different directions. It's a kind of disappointment. "For now, there is no divide in the group, even if it may look like it. I'm still waiting for some reaction from the players. It's their choice if they do." Despite the defeat, France still progressed to the quarter-finals, where they will face England, and Lievremont insisted that he has no intention of giving up on his side just yet. "Naturally, I am a fighter, I believe in the men, in a group who hopefully know how to pick themselves up," he said. "I have got experienced and talented players. But maybe not as talented as I thought." The French coach then admitted that he finds it difficult to connect with players who have been completely raised in the professional era, raising comparisons between his troops and France's footballers, who, in last summer's World Cup, rebelled against their coach, Raymond Domenech. "I've got respect for them and think highly of them, I talk to them openly," he said. "I think it is reciprocal even though I am under no illusions. "We live in a society where image matters. I saw players with their agent on the eve (of the match) and after the game instead of regrouping as a team. "They have their career to manage, and perhaps the media to please. French rugby and players laughed at the French football players last year. But in some respect, we didn't get off the bus either. "For some, I might just be a ProD2 (Division Two) coach, absolutely not competent to train a team of the level of the national squad. Some compare me with Raymond Domenech. You must know that I have got an immense respect for him. "He did fight. I know what that means and, I repeat, I have absolutely no intention to give up. I've got my share of responsibilities, but do you sincerely think that it is because of my management that we failed to be committed in the game? There is a lack of collective dynamism." 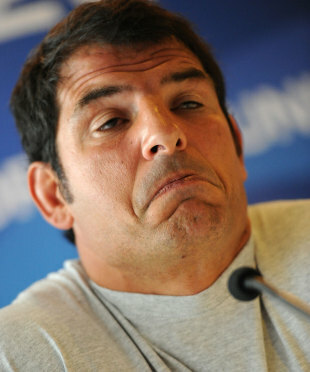 Lievremont then threw his full weight of support behind his captain, Thierry Dusautoir, who has also been strongly criticised for his leadership. "I want to give Thierry Dusautoir a message. Only he is exemplary. He spends a lot of energy to mobilise his troops," he said. "He is heavily criticised. He should only focus on his performance."